While Moana tried her hardest to obey the rules, some people just can't be held back! There was no way she could escape the call of the ocean. The call to save her family. And once she was on the open ocean, she rode the waves like an expert. Well, sure, she had a few hiccups. She learned she had to stay alert by the end of the first night! But after that, she learned her lesson and not only stayed on top of the waves, she rode them! Did you feel tugged to set sail when watching Moana? Did you wonder how far you could go if you unfurled your sails? We all have that horizon to aim for, after all. Want to tap into that inspiration this character woke in you? 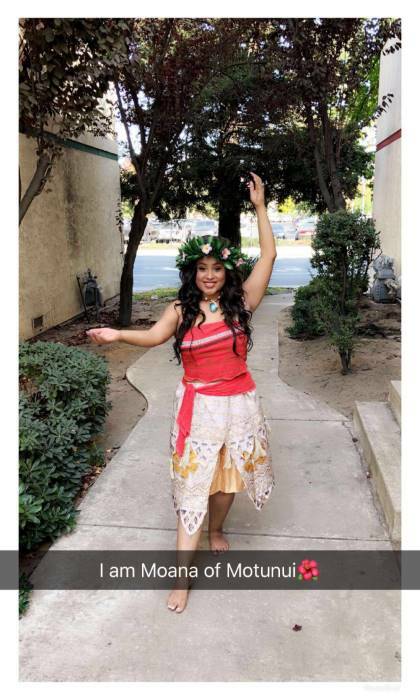 Become the quick-witted, brave Moana at your next costumed event! You'll feel ocean ready when you put on this dress. No need to worry about it slipping down as you pretend to paddle through your obstacles, it's fitted with clear straps. The top is lush with Polynesian prints and knots on the side for an asymmetrical look. The skirt has two layers and is around knee-length, letting you move with ease. To top it off a necklace bearing the heart of TeFiti is included. So, if you're ready to see what's out there from a new perspective, this costume will give you a sense of adventure. Want a complete look? Make sure you top off your look with a long, curly hairdo. With a look like this, you're sure to go far! Loved that costume! It was very comfortable!